No one likes a leaky diaper. Unfortunately, that’s the situation Ghada faces daily with her CH cat, Pepa. Pepa, a 7-month-old cat with severe CH, cannot walk, stand, or control her bladder. First off, Ghada, I commend you for keeping it together during this tough time. It speaks greatly of your love and devotion to Pepa! That said, I’m sure you agree it would be nicer to spend more actual quality time with Pepa than worry about her diapers. Second, I’ve been thinking about this a bit more, and I’ve come up with a few suggestions that may help. At the end of this post you’ll also see that I’ve asked this blog’s readers to chime in, too. Hopefully we’ll be able to come up with a solution for you soon! 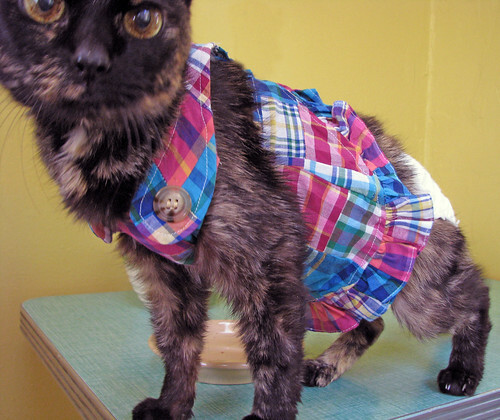 If you haven’t had a chance already, I recommend looking through this post: Should My Special Needs Cat Wear A Diaper? About a third of the way down, there are some specifics about how you should choose a diaper for your cat. While weight is an important factor, experienced owners say other factors, such as your cat’s hip size and the length from your cat’s hips to tail can also impact the size you choose. I’d also recommend watching both videos and reading the tips under the videos. Two tips that may help in your case: Consider putting the diaper on backward (this can make it more difficult to take off), and reevaluate the tail hole size (if it’s too big, you may get leaks). In May, Natalie was gracious enough to send us step-by-step photos of how she diapers her CH cat, Dimity Jane. Perhaps going through Natalie’s photos will give you ideas of how you can modify your process. Some diapers can’t hold a lot of liquid: Choosing more absorbent diapers may help. Some diapers are too loose: Consider tightening the diaper. Some face a combo of both of the above problems: Those parents suggest going with a diaper one size bigger, and tightening it. There are even products out there called “diaper doublers” – pads that you insert into a diaper that hold extra liquid. Perhaps you can use a little creativity to modify one for Pepa or come up with something similar. I know you also mentioned that it’s been hard to keep your carpet clean with Pepa’s leaks. Perhaps as you start to experiment with different types of diapers, you can confine Pepa to a smaller area. That way you can test diapers and see how they do before letting her lose. It’s an extra expense, but perhaps a playpen would be a good way to keep her confined. You can find out more about playpens here. I’d recommend laying down old towels and/or a waterproof pad in the playpen for easy cleanup. Readers, do you have any suggestions for Ghada? What have your experiences been like diapering your cat? If you have faced something similar, how did you solve the problem? Hi Ghada, Sorry I cannot help you with your diaper situation however I may have a suggestion for your carpet/rug problem. I had some leftover upholstery material Approx 3 x 3 yds) and some leftover table padding ( can be purchased at a fabric store by the yard and the upholstery material in the remnant section). The material gives our kitten some traction and she just loves to “ball” up the material. Plus if she pees on it it can be washed fairly easily even though it is upholstery. The table pad can be place under the material with the felted side up and the plastic laminated side down – this helps hold the material and provides a barrier for the carpeting. We initially used a portable crib/bassinet left over from our granddaughter. The sides are mesh so the kittens (we had 2 originally) could not get hurt or crawl out or get stuck in betweeen the slats. And clean up is fairly easy due to the pad. I covered it at night with a blanket as both were climbers. You may want to look for something like that at garage sales. Those are great suggestions, Monika. Thanks for sharing! Just one addition to Amanda’s wonderful suggestions. I use size 1 human diapers, meant for newborns, and cut a tail hole that is flat under the tail (like an isosceles triangle △), and pull up the back until it’s snug under the tail. Then when I do up the tabs, I make sure both are very tight and I pull them over as far as they will go, which in Dimity’s case is all the way to the other hip for the first tab, and all they way around to the back for the second. Then I pull up the leg holes (which do have elastic in them), so Dimity is comfortable and has freedom of movement. Because the diaper is tight around her waist, she is not able to wiggle out of them (and she slithers into some very tight places) and I have not had any trouble with leakage of anything. And she’s had some pretty bad diarrhea at times, and pees a lot. I think it’s all in the technique. Don’t worry about the waist being too tight — the way the diapers are constructed, it’s not really possible. Dimity flops around sometimes, too, and she has never flopped out of a diaper. A few of my Facebook friends or their sibs have had to wear diapers and struggled too. –Another resource I would suggest contacting is Best Friends Sanctuary in Utah. They have an entire unit, Quincy’s House, devoted to cats with special needs and many who are incontinent. Wendy, Willow’s Mom, found them to be a helpful resource. –Tenth Life Cat Rescue in St. Louis is another pawesome resource in that they help special needs kitties. One of their foster Moms Bobbi Hale, is currently looking after a paralyzed kitten named Sinatra who wears diapers. He has something he wears over them called ‘fancy pants’, which have cool patterns on them. I’m sure if mew asked they could put mew in touch with her and see what ideas she has. I believe she expresses his bladder a few times a day too to help minimize his urinating in a diaper. –One final resource I know of is Tabby’s Place in NJ. They are a sanctuary for special needs cats like Baby Dot who recently was adopted. She has spinal bifeda and is incontinent. They have many techniques and methods they use and I’m certain would be happy to advise mew. Don’t be afraid.to call or write them and share mewz situation and need for advice. Each of them adore special needs kitties and want them to have a forever home, so if they can assist mew with any problems that will help keep them in mewz home they will do so. Thanks for all of the resources, Ms. Phoebe! This is tremendous! Have you tried onesies over the diaper? It may help it stay on. Onsies are GREAT! I use them on my cat who wears diapers otherwise she rips them off. You might have to throw a few stitches in the head hole to make it smaller, my little Amaya will slip out the top if I don’t.